A comprehensive curriculum including activities that target reaction time, visual spatial acuity, attention and concentration, memory, language, and problem-solving in progressive order shows promise for slowing cognitive decline. Battles have characterized the 12 years one organization has spent developing effective interventions for combating cognitive decline. In order to help people fight back against mind- and memory-robbing diseases, such as Alzheimer's disease and related dementias, the New England Cognitive Center (NECC) has had to resist the prevalent attitude that the only things to be done for individuals with moderate to severe dementia are to make them comfortable and keep them safe. It was also necessary to fight for recognition that nonpharmacological interventions could prove effective in stabilizing and possibly improving cognition in this population. Fortunately, cognitive training as a means for improving cognitive functioning in older adults has received increased attention and acceptance over the past few years. Much of this attention is related to the aging population and increasing concerns older adults have about cognitive decline and dementia. 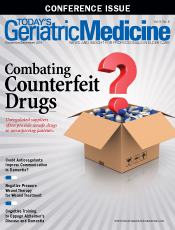 However, while studies have been conducted with healthy older adults to determine whether cognitive performance can be maintained or improved,1,2 less research has been devoted to studying the impact of cognitive training on older adults who are already experiencing cognitive decline due to dementia. This neglect of the population suffering from dementia is perhaps not surprising, given the progressive nature of dementia and the nearly absent expectation of improvement. A 2013 review of this literature concludes that evidence for the effectiveness of cognitive training for persons with mild to moderate cognitive decline is generally lacking but that existing research is of low to moderate quality.3 Consequently, NECC has been committed not only to developing cognitive programs but also to finding the means to work with independent researchers to measure program outcomes. With its strong ties to academia, NECC bridges research and application and maintains a multidisciplinary approach to program and materials design. From the beginning, the organization has tapped the knowledge of experts in neuroscience, psychology, and geriatrics to create the foundations of its cognitive programs and later, to measure program efficacy. These working relationships enable the group to combine the latest advances in neuropsychological research with sound educational principles to create interventions that are scientifically sound, yet easy to deliver. The resulting multilevel, multidimensional, and targeted programs are designed to provide practice and reinforcement over multiple sessions to foster learning and generalization, maximize challenge, and be adaptable to participant needs. The organization's relationships with retirement and assisted living communities, long term care facilities, and senior centers provide opportunities to develop and field test its programs with the actual constituents for whom the programs are designed. This network of relationships provides a model for ongoing development, testing, and improvement (See Figure 1). Much has been written about neuroplasticity, the brain's ability to adapt and change. This important capacity has allowed mankind to survive and thrive. Through learning, the brain is able to reorganize itself and form new connections. The authors examined the possibility of slowing cognitive decline and potentially effecting improvement by harnessing this ability to learn, attempting to retrain individuals suffering from varying degrees of cognitive loss. Since there were no models to employ in the program development process, theory and best practices from education were utilized to cement together basic building blocks to create a solid science-based foundation from which innovative programs could be developed, targeting groups of individuals with differing cognitive needs. A standardized model containing key components was designed and repeatedly tested, eventually forming the basis for all of the organization's programs. Central to this was the concept that each program session should attempt to provide a full brain workout, systematically stimulating the six major cognitive domains. A comprehensive curriculum was carefully developed for each program level consisting of activities targeting reaction time, visual spatial acuity, attention and concentration, memory, language, and problem solving in a progressive order. Researchers used visual, auditory, and kinesthetic sensory modalities, and paid careful attention to include the key educational principles of graduated challenge, repetition, and reinforcement. The concept that learning takes time influenced the decision to design programs consisting of 24 one-hour sessions to be delivered twice weekly, resulting in a three-month program schedule. While early trials of the programs included a computer component, this was eliminated for several reasons. Testing showed that training in small groups produced better outcomes, the required one-on-one assistance was thought to be cost prohibitive, and use of the computer hindered future dissemination. As programs have been designed and tested, a standardized facilitator-training model was developed and successfully implemented. Program facilitators are trained to deliver the programs in personalized learning environments that are comfortable, supportive, and fun for participants. This model encourages facilitators to make the most of teachable moments by offering strategies that foster generalization—the transfer of learning into daily living. Other important facilitator functions include assessing participant reaction, modifying activities or pace as needed to meet the challenge needs of a group, and helping participants recognize improvements, both small and large. Training also underscores the importance of an adult-oriented approach in which facilitators explain the value of the activities and the possible benefits to be gained from participation. The type of cooperative learning environment that is created captures the affective component in learning, leading to increased ownership of learned skills. Additionally, the social aspect enhances program impact, improves motivation to participate, and provides participants with the opportunity to offer one another mutual support and encouragement, all of which can continue even after the programs end. 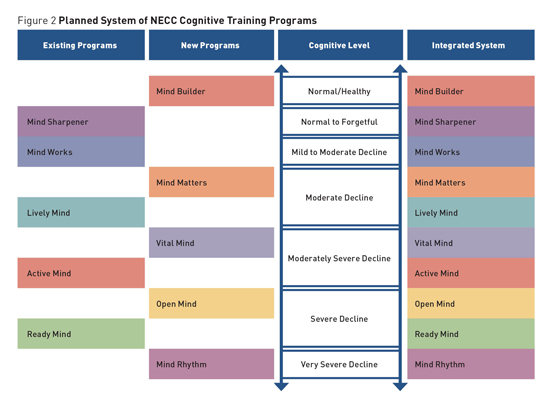 Currently there are four programs ready for dissemination in the Mind Aerobic Suite of Cognitive Programs. The Mind Sharpener program targets individuals who have no impairment or very mild cognitive decline, with some complaining of word-finding difficulties and subjective complaints of forgetfulness. This program was developed to serve facilities such as retirement communities and senior centers. The Lively Mind program is designed for those diagnosed with mild or early-stage dementia. While many still live at home, they generally require some assistance with independent living and may attend adult day care. The Active Mind program is most appropriate for adult day care centers or assisted living facilities with secure memory units. Most participants have received a diagnosis of moderate or midstage dementia and require some assistance with activities of daily living and 24-hour supervision. The Ready Mind program is designed for individuals who require substantial assistance with activities of daily living and who may have been diagnosed with moderately severe dementia. This program was developed for secure units at assisted living or skilled nursing facilities. A fifth program, Mind Works, is in its final development and testing stage. This program, which should be available in late 2016, targets individuals who may have been diagnosed with early-stage dementia. Beyond these five programs, plans are in place to develop five additional innovative programs to create a system of 10 integrated cognitive training programs ranging from an extremely challenging program designed for individuals seeking to prevent cognitive loss to a program targeting those with severe dementia who have lost most or all of their ability to read and write (See Figure 2). The organization's researchers have been committed to studying the impact of its cognitive training programs on cognitive and behavioral functioning. Before discussing the outcomes of its research program, it is important to provide some details regarding how outcome research has been conducted. First, studies have investigated delivery of the programs in group/class formats, individually, or with a computer component. However, the majority of studies have delivered programs in a group/class format. Second, a variety of different research methodologies have been employed (eg, single subject designs, within subject designs, between group designs). Third, all studies have administered a variety of different outcome measures. Cognitive outcomes have been measured using psychometrically sound neuropsychological tests. Typically, all six cognitive domains are measured, and it is common that more than one measure is used to assess some domains. For example, different types of memory functioning (eg, immediate/delayed, verbal/visual, recall/recognition) and attention skills (eg, simple, selective) are typically assessed in a given study. Also, because cognitive training programs may effect changes in noncognitive domains of functioning, it is common that outcomes such as depression, functional abilities, and perceptions of an individual's memory functioning are also assessed. Research conducted on early versions of the programs produced encouraging results. These early studies found that overall cognitive functioning could be improved, and increased performance on measures of specific cognitive abilities such as short-term verbal memory could be achieved.5 When improvement in a cognitive domain was not found, stability (ie, lack of decline) was the typical outcome. Given that cognitive decline is expected in the context of dementia, observing stability, let alone improvement, in any area of cognitive functioning is promising. Overall, early studies demonstrated a general pattern of stability as well as mild to moderate improvement on a variety of cognitive abilities. Findings on a variety of noncognitive outcomes such as depression, perceptions of memory functioning, and functional abilities were also positive, suggesting that the benefits of cognitive training may have more wide-reaching effects. Further, anecdotal data derived from care providers in these early studies indicated that many participants were displaying positive changes outside of class meetings. For example, some participants were reportedly spending less time alone in their rooms, speaking and socializing more, showing more positive affect, and making statements about looking forward to attending class meetings. Overall, findings from early outcome studies indicated that the programming was on the right track and that intensive cognitive training programs could potentially benefit those with mild, moderate, and even severe cognitive impairment. Early research not only provided the impetus to continue delivering cognitive training programs in the field but also led to improvements and updates in program content, culminating in the current versions of the programs. Modern versions of the programs have only recently been made available, so research remains in its early stages. However, available findings continue to suggest that cognitive training programs show promise for those with dementia. For instance, in 2011, the organization received a demonstration grant designed to disseminate its programs in three different settings within the state of Connecticut. As part of this project, a program evaluation component was included to study the effectiveness of the programs. A variety of cognitive and noncognitive outcomes measures were administered prior to starting the classes and again 12 weeks later when classes were completed. Stability and/or improvement was found on nine of 13 outcome measures for Lively Mind, seven of 13 outcomes for Active Mind, and 10 of 13 outcomes for Ready Mind. Improvements on measures of depression, perceived memory functioning, and visual memory were observed across all three programs. In the 2014 to 2015 timeframe, a small randomized controlled trial was conducted to examine the Active Mind program.6 Participants were randomly assigned to that program or to a wait-list control group. A total of 23 individuals with moderate cognitive impairment (defined as scores between 77 and 48 on the Modified Mini-Mental State Examination7) participated in the study. The intervention group outperformed the control group on eight of 14 outcome measures, with the biggest differences occurring in measures of working memory, perceptual speed, and executive functioning. When looking only at the intervention group, small to moderate improvement on eight of 14 outcome measures was observed, and stability occurred on four measures (there was decline on only two measures). On the other hand, the control group showed decline on nine of 14 measures, stability on three measures, and small improvements on only two measures. Unfortunately, this study found no meaningful between-group differences on measures of behavioral functioning such as depression, quality of life, activities of daily living, and behavioral problems. The overall pattern of results, however, suggested that participating in the program produced mild to moderate benefits on various measures of cognitive functioning, a noteworthy finding in this program that targets individuals with moderate cognitive impairment. Additionally, exit interviews with facility staff who delivered the programs indicated that they enjoyed leading the program sessions. Staff reported finding the materials user-friendly in that they required little preparation time (ranging from five to 10 minutes) and the training manuals were clear and easy to follow. Staff also indicated that participants enjoyed the classes. All participants completed at least 75% of the classes, and no one dropped out of the study because of disliking the classes. 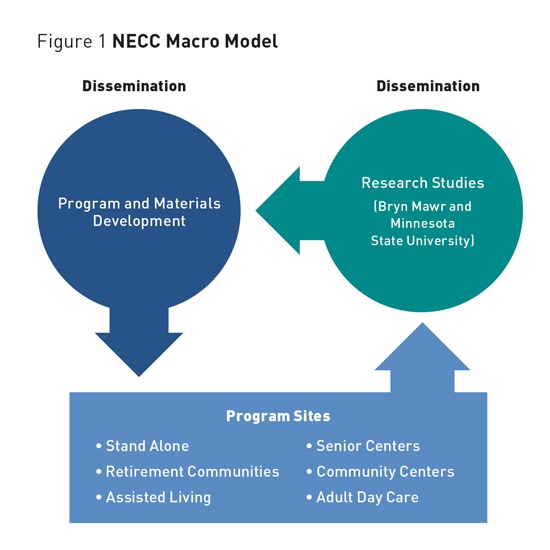 Ongoing pilot work continues to focus on small studies designed to examine the effectiveness of each program as implemented in settings such as adult day centers and assisted living facilities. For example, a small study examining the effectiveness of the Lively Mind program is currently being conducted. One unique aspect of this study is that participants are completing the program on two consecutive occasions to determine the possible benefits of ongoing participation in the program. Measurement occurred prior to starting the classes, after completing the class once, and will occur again after completing the class a second time. And program evaluation research is being conducted in conjunction with Jewish Family Service of Metropolitan Detroit, which is delivering the entire suite of programs to its consumers. Much work remains to be done to better understand the effectiveness of these cognitive training programs, and many unanswered questions will be addressed in future research. Larger randomized controlled trials are needed to more firmly establish the effectiveness of the programs. And studies including active control groups will be necessary to determine whether the programs work better than other forms of cognitive stimulation that are readily available at home or in facilities such as social groups, physical activity, or artistic activities. Additionally, future studies will need to examine longer-term follow-up. Currently, the longest follow-up period included in any study is three months. More work is necessary with regard to facilitator training. For example, measures of facilitator adherence and competence must be developed to ensure that programs are being delivered with fidelity. Finally, as mentioned previously, many anecdotal reports of dramatic improvements in social behavior both during and between classes have been reported from caregivers of participants. Future research must include measures of social behaviors to determine whether such anecdotal reports represent anomalies or whether they are common occurrences. In the areas of both cognitive program development and research, much work remains. While it is unrealistic to believe that cognitive training will ever provide a cure for Alzheimer's disease or the many diseases that result in cognitive loss, this type of intervention is proving to be a useful tool in helping individuals achieve some level of improvement or stability. Perhaps even more importantly, well-developed cognitive programs can allow individuals experiencing cognitive decline to take an active role in maintaining or improving their cognitive health. Many experience progress rather than decline only, and can potentially remain at home longer. While it is important that support, comfort, and safety are provided for people with dementia, it is now possible to provide programs that can restore hope and offer the weapons to fight back. — Jeffrey Buchanan, PhD, is a professor of psychology at Minnesota State University in Mankato whose research focuses on evaluating nonpharmacological methods for improving the quality of life for individuals with neurocognitive disorders and their caregivers. — Patti Celori Said is the executive director of New England Cognitive Center. With a background in academia, she has been the driving force behind the development of the Mind Aerobics Suite of Cognitive Programs. 1. Ball K, Berch DB, Helmers KF, et al. Effects of cognitive training intervention with older adults: a randomized control trial. JAMA. 2002;288(18):2271-2281. 2. Rebok GW, Ball K, Guey LT, et al. Ten-year effects of the advanced cognitive training for independent and vital elderly cognitive training trial on cognition and everyday functioning in older adults. J Am Geriatr Soc. 2014;62(1):16-24. 3. Bahar-Fuchs A, Clare L, Woods B. Cognitive training and cognitive rehabilitation for mild to moderate Alzheimer's disease and vascular dementia. Cochrane Database Syst Rev. 2013;(6):CD003260. 4. Cohen J. Statistical Power Analysis for the Behavioral Sciences. 2nd ed. New York, NY: Routledge; 1988. 5. Mate-Cole CC, Fellows RP, Said PC, et al. Use of computer assisted and interactive cognitive training programmes with moderate to severely demented individuals: a preliminary study. Aging Ment Health. 2007;11(5):485-495. 6. Said PC, Gaydayenko Y, Buchanan JA. Evidence-based cognitive programs for Alzheimer's disease and dementia: from implementation to outcomes. Paper presented at: American Society on Aging Annual Meeting; March 21, 2016; Washington, D.C.
7. Tombaugh TN, McDowell I, Kristjansson B, Hubley AM. Mini-mental state examination (MMSE) and the modified MMSE (3MS): a psychometric comparison and normative data. Psychol Assess. 1996;8(1):48-59.